After having started the MRC website back in 2006, we have since then been able to increase the scope of our webpages by adding quite a number of articles describing specific medical items, unit histories of medical units, personal reminiscences of Veterans, all with the aim to further explore the “medical” theme. As we firmly believe in communication, we have also set up a Forum where medical collectors can exchange and discuss their favourite topics with others. As stated, the MRC website is an amalgamation of the efforts by both Alain Batens and Ben Major. The project has been 100% privately funded by us, and represents a unique perspective and compilation of different aspects of the US Army Medical Department in World War 2. Based on current statistics (over 680,000 visitors), we are convinced that our site is of good use to the many WW2 US medical collectors and re-enactors. General interest from the public has dramatically increased over the years, and the amount of daily correspondence received is amazing. 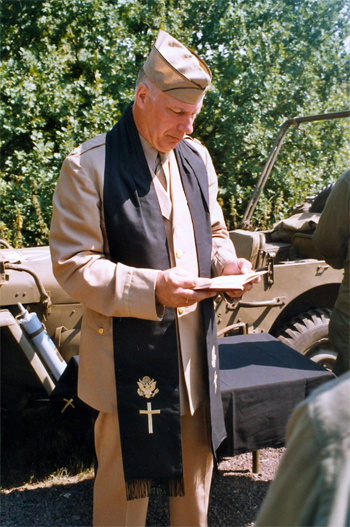 WW2 impression – SHAEF Chaplain, summer 1944. My name is Alain S. BATENS – I am a Belgian citizen, WW2 militaria collector, historian and researcher, particularly fascinated by Military History. My general interest goes to the World War 2 period and the Allied Armies that liberated my home country. I have always had a fondness for the United States Armed Forces, and am more specifically interested in the US Army’s Medical Department and the US Corps of Engineers, which served in the European Theater of Operations (E.T.O.). WW2 impression – Battalion Surgeon, 94th Infantry Division, September 1944. I am Ben C. Major – a British collector and researcher of WW2 militaria and in particular US medical equipment. 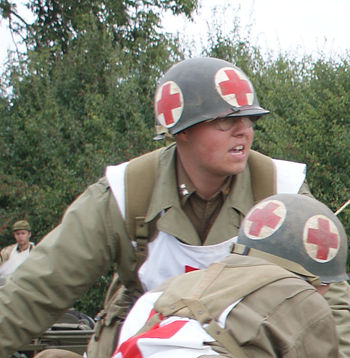 Although primarily interested in the history of the US Army Medical Department during the Second World War, I have also fostered a certain interest in WW2 re-enactment, often portraying a Battalion Aid Station impression pertaining to the 82d US Airborne Division. I started collecting like my good friend Alain at an early age (around 10-11) and subsequently became actively involved in re-enactment too. My implication and interest in the history of the Medical Department was a gradual one, and I began to research the topic more and more, through a number of different sources. Here at the WW2 US Medical Research Centre, we believe that collectors, re-enactors, researchers and historians, should have access to decent information to assist them with their research. As a result, the website was set up to offer fellow collectors, and other people with similar interests, the opportunity to expand their knowledge about the subject. It was also the intention of the founders to bring the WW2 Medical Research and Collecting community together, and allow them to communicate with other people interested in the same topics. We really do welcome comments, remarks, and any other information that our visitors/readers may be able to offer, and we sincerely hope that the data and illustrations supplied here is of use to them. The majority of illustrations and descriptions of medical items are based on the individual collections of the MRC founders. Fortunately, additional help has been forthcoming from outside sources, including pictures and historical documents, shared or provided by Veterans, next-of-kin of Vets, individual militaria collectors and researchers, for which we are truly thankful. September 2006 We began work on the Item Number database, and began to add items to it. October 2006 The database was completed, and we both went through our collections to ensure that the items which had been entered were correct. End of October, 2006 The main website layout was started, and the pages began to take shape. We worked on some more features for the website, as well as ensuring the database was kept up-to-date. November, 2006 The forum for the website was created, and formatted to fit in with the website. Also, many articles were completed and uploaded to the website. End of November, 2006 A number of new articles were written and uploaded to the website, as well as a number of lists. December, 2006 A number of new articles were completed and added to the website, including ones featuring a list of US ETO Hospitals. In addition, the links section was added to the website, and the search engine for the site greatly improved.